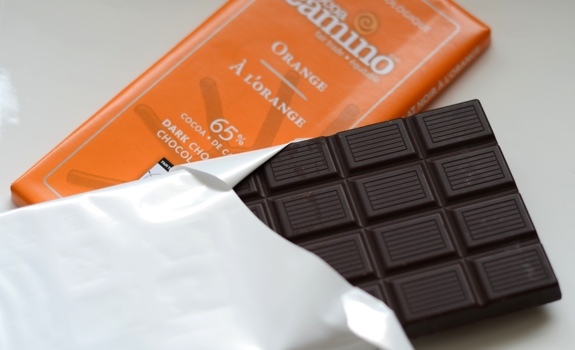 An Orange Cocoa Camino chocolate bar, in the old-style packaging. It's certainly a bit much for one sitting. Part of the fun of having a site like this is getting tips from readers. Back when I wrote about Terry’s Chocolate Orange in December, commenter Darrell pointed me in the direction of several other orange-infused chocolate bars, including this lovely specimen from Cocoa Camino. See, Terry’s Chocolate Orange is great, but it’s not available year-round, and it’s not exactly made with the most spectacular chocolate in the world. It’s about the novelty, more than anything else. With Cocoa Camino, the quality of the chocolate is evident, though even more important is the fair-trade process involved in sourcing the cocoa. Having lived in a part of the world where cocoa is produced, I’m reasonably aware of the good (jobs) and bad (uh, where to begin?) aspects of cocoa as a cash crop. With fair trade cocoa, I feel slightly less guilty about indulging in chocolate — the calories, though, remain just as guilt-inducing. The chocolate itself is nice and dark (65 per cent cocoa), with a fruity character. The orange flavouring verges on candied orange peel, sort of marmalade-like. It’s very natural tasting, with a tart twang that blends beautifully with the chocolate’s sweetness. It’s very, very nice. Cost: $4.99 per 100 gram bar at Planet Organic. Value for cash money: Good for something like this. Nutrition? : 220 calories per 40 grams. So, per 100 gram bar, that works out to 550 calories. (Maybe share it with someone special?) Some protein, some fibre, and a lot of fat (including 50 per cent of your daily value of saturated fat per 40 gram serving). Quite a bit of iron, though. Made in: Switzerland! Cocoa Camino’s parent company, La Siembra Co-operative, is based in Ottawa, Canada, but I guess the chocolate is Swiss-made. Compared to Terry’s: Terry’s is WAY sweeter. The wallop of orange flavouring is key to Terry’s, whereas the Cocoa Camino bar is about the combined chocolate and orange experience. Packaging: It may have changed. The Cocoa Camino website features a different wrapper, as does the new stock in my local Planet Organic. The verdict: Completely worth it as an occasional indulgence. Oh I had overlooked another very good Canadian chocolate bar, this one from the west coast. The company is http://www.denmanislandchocolate.com & I had usually found them at Planet Organic. If not with the other chocolate bars, in a little wooden shelving unit up by the cash registers.